Gay vs. Orthodox: A Deadly Turn in Israel's Culture War? Israeli police launched a citywide manhunt through Tel Aviv for the masked, black-clad gunman who opened fire with a pistol at a gay youth club on Saturday night, Aug. 1, killing two and wounding 15 more. While the authorities have been careful not to speculate on a motive for the crime, the city's stunned gay community was not hesitant about assigning blame for the atmosphere they believe was conducive to the crime. Pointing to Orthodox Jewish gay-bashers, gay activists say the shots fired in the club for teenagers  the most serious in a series of verbal and physical attacks on their community  were a violent manifestation of Israel's ongoing culture war. The attack spotlights the tensions within Israeli society as it tries to balance Western liberalism and Orthodox Jewish values. Tel Aviv is considered one of the world's favorite gay holiday destinations, celebrated for its nightlife, carefree beaches and tolerant atmosphere. In 2005, the city launched the country's first municipally funded gay center, and in 2007, the Israel Ministry of Tourism launched a marketing campaign specifically targeting the gay community, featuring photographs of tattooed, yarmulka-clad men kissing. 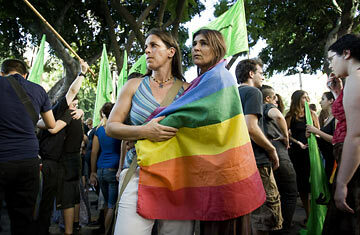 In many areas of Israel, gay couples are treated as equals. They can adopt children and enjoy equal inheritance rights. The Israeli diplomatic service was one of the first to grant full rights to gay partners. Passions can run high. Advertising billboards featuring scantily clad women are periodically destroyed. There is a legal battle under way over demands to run separate public buses for men and women on routes serving ultra-Orthodox neighborhoods. Recently Jerusalem has seen weekly protests over a municipal decision to open a parking lot on the Sabbath. Last year, a former Health Minister from the ultra-Orthodox Shas Party blamed a series of small earth tremors on the rise of homosexual activity. Earlier, Shas had led religious opposition to gay couples' being granted the right to adopt children. Nitzan Horowitz, a gay lawmaker from the left-wing Meretz Party, blamed the attack on "years of unremitting incitement from parliamentarians, rabbis and public figures." He added, "I attribute this to the general incitement and hate with which we have been contending for years in this community." Shas, however, was quick to condemn Saturday's killings. "We are shocked and bereaved, and denounce without reservation the murderous incident that targeted Tel Aviv's gay community," the party said in a statement. Israel's chief rabbis described the killings as "an unthinkable, vile crime." Still, the ultra-Orthodox and the gay community have been known to come to physical blows. Gay activists recall the 2005 pride march in Jerusalem, when an ultra-Orthodox man leaped into the crowd and stabbed three marchers before he could be restrained by police. The violence came after the city's ultra-Orthodox mayor had tried to ban the march but was overruled in court. The following year, police ordered 12,000 officers to protect a few hundred marchers from possible ultra-Orthodox violence. Even Tel Aviv has not been exempt from gay-bashing. Gay activist Shlomi Laufer, writing in Tel Aviv's daily Yedioth Ahronoth, recalled two men embracing on the boardwalk being spat on and others being chased with baseball bats and even stabbed. "The problems in Israeli society run very deep," Saar Netanel, a gay leader and former Jerusalem city councilor who opened the city's only gay bar, tells TIME. He explains that while Jews are united by their conflict with the Palestinians, the obsession with security comes at the expense of dealing with other social issues. "There are more than two societies here," says Netanel. "It's a very diverse population in Israel. There is one part of Israel, my camp, for whom the temple is the Supreme Court and we believe in democracy and we want a liberal and modern country; and there is a part of Israel that wants a more religious country  some of them even want the rule of Jewish law, not a democracy. They don't believe in the courts  they believe in the law of the Torah." For many Israelis, Saturday's killings recalled the assassination of Prime Minister Yitzhak Rabin in November 1995, when a lone shooter capped months of hate-filled rhetoric against Israel's elder statesman by gunning him down as he left a peace rally in the same city. "The pistol did not act on its own, the gunman did not act on his own  what stood behind him was incitement and hatred," Labor lawmaker Shelly Yachimovich said at an impromptu gathering near the site of the shootings on Sunday, consciously echoing comments made after Rabin's assassination.